Above the long, untamed grass sits a lonely picnic table covered with three orange pumpkins and a few chipping pots. Next to the table, John Waters rests in his dark green camping chair as he describes the little niche he has created for himself. He motions towards a few sprouting ferns that surround him and, with a smile, adds that he planted the small trees himself. One step above homelessness, Waters has found both peace and hope in this space — a space, which to him is “therapeutic.” Just a block away from the fast-paced El Camino Real, Waters says he and those like him feel alienated in the affluent town of Palo Alto, a city that does not accept them, despite the fact that they are only trying to survive. Waters, a Palo Alto High School Class of 1964 graduate, is happy to tell his story. Just a few feet away from the picnic table, his home is parked parallel to the sidewalk — a rusty green van overflowing with cans, paper scraps and dingy clothing. Due to the high cost of housing in the Bay Area, Waters has been forced to live in a van. While he is indisputably in Palo Alto, he feels a barrier between vehicle dwellers and other residents. In Palo Alto, vehicle dwelling was long one of the few forms of affordable housing. However, three years ago, pressure from local residents as well as neighboring community’s restrictions caused the City Council to pass a law prohibiting living in a vehicle. Although the City Council repealed the law in 2014 before it went into effect, Waters, as well as the other vehicle dwellers behind Fry’s Electronics, still face resident complaints, specifically one woman who has notified the police to investigate their presence multiple times. With the constant threat of angered residents and tow warnings from parking law enforcers, Waters has had to recreate his life. After decades of living in a van, he has acclimated to the lifestyle shift and the difference in priorities. However, Waters says that living in an RV may not be as hard as some people may imagine, as he points to his solar panels and television set attached to the top of his van. Yet, the way Waters and other vehicle dwellers live puts them at risk of breaking community laws, according to Stump. Since vehicle dwellers may not have access to a bathroom or garbage, they may violate laws such as the prohibition of littering in the street. In response to resident complaints, vehicle dwellers are often investigated by the police and forced to move their homes, according to Stump. LOOKING BACK Palo Alto resident and Paly graduate John Waters reminisces on years of being hidden from most of the affluent city. As a vehicle dweller, Waters has an untraditional lifestyle based in an empty lot. Like Waters, Pete Vankuran has also been affected by resident complaints during his short time in the RV community. However, compared to his long and tasking journey back to Palo Alto Vankuran says that his life as an RV dweller is a vast improvement. After graduating from Paly, Vankuran worked as a truck driver, transporting a variety of goods and merchandise from one location to the next until five years ago, when he lost his job. Although he lived with his parents for a few months, he eventually had to leave their house, resulting in a period of homelessness. After finding his way back to his hometown of Palo Alto, Vankuran recently joined the RV community, an escape from sleeping on the streets. Despite the presumed low standard of living, Vankuran says he has found a community of his own — a pleasant contrast to his previous years of hardship. “We help each other out, we’re all friends around here,” Vankuran says. While some have a long history with this RV community, others, such as Claudio Garcia, are relatively new to Palo Alto. Garcia came to Silicon Valley with the construction company McCarthy, leaving his home and family in Phoenix, Ariz. 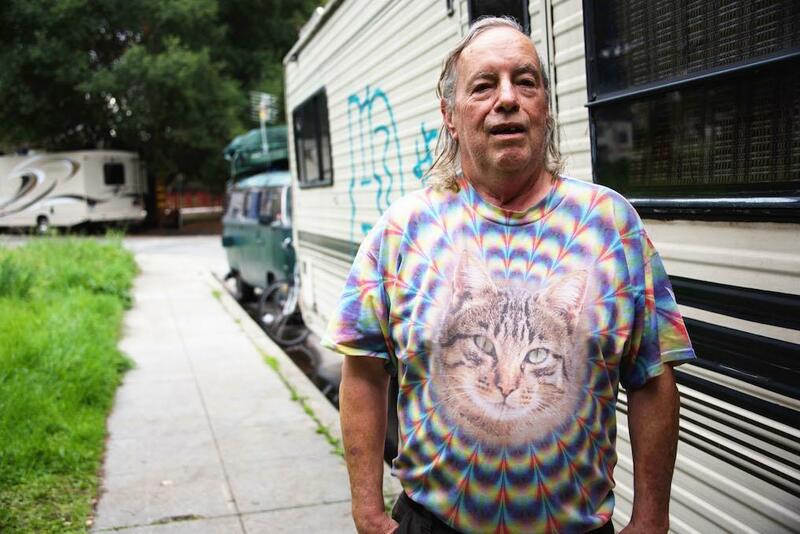 Although his RV has been an ideal means of transportation, Garcia misses his family back home. Garcia has lived in locations such as Utah, Colorado and New Mexico before coming to Palo Alto, following the company in his RV. Throughout the country he has noticed a common misconception in the public’s view of RV residents. “They think I live for free, but this $70,000 RV is not for free,” Garcia says. Fred Smith, another current vehicle dweller, also acknowledges this lack of understanding from the broader community. A former Silicon Valley techie, Smith has a loving marriage and raised a son in the Palo Alto community. In 2007, however, he lost his job as a software engineer and his rent began to eat away at his savings. Smith has stitched together a new life for himself and his wife. Although Smith is content with his life, he feels that community members tend to judge vehicle dwellers because of their lack of a “real” home. He says people associate the lack of a home with being a criminal. These stereotypes are prominent among concerned parents, especially since there is a community playground in the close vicinity. A couple of Smith’s friends have encouraged him to find an affordable apartment elsewhere to escape the struggles of the RV life. Smith has considered relocating to Illinois, New Mexico or Las Vegas; however, he feels a strong connection to Palo Alto — the place he calls home.